If there was a perfect online retailer, all 7 billions of people would shop exclusively there. Luckily, even Amazon is far away from being completely impeccable, so that each of us gets a little bit of market share. No matter what you do, customers will always have something to complain about; even a store with super high-quality products for exceptionally reasonable prices would have things the shoppers don’t like. Does it mean you should tolerate the flaws of your online retailer? As an entrepreneur, your task is to admit, profit from your mistakes and correct them. In this article we’ll discuss the most common flaws, and their solutions, which have the greatest negative impact on your clients. After all, customers are everything you need to prosper, so take care of them. The absence of product description is one of the biggest no-nos in e-Commerce. No matter how good is the product itself, in the world of virtual reality (and that’s where all the e-merchandise is going on) it has no value without a paragraph of passionate description. The thing is, your customers have no other way to get to know what your offer is all about. You don’t expect them to make a blind purchase, do you? Copying the manufacturers descriptions for the products is another mistake. Who are you going to compete having the identical walls of text with a hundred of other retailers? Such approach will cause a negative impact on SEO, making it hard to find you on Google by a search request. Moreover, manufacturer descriptions rarely appear to be interesting and engaging - mere characteristics listing won’t shock anyone. The third case is the most ignoble - wrong product description. Though it often happens absolutely unintentionally (because of technical problems or inattentiveness), it leads to the most drastic results - loss of trust, angry feedback, refund and even suing. Visual perception is the most important informational channel for a human being. That is why people tend to judge about the product from what they initially see, and product photo is the first thing they pay attention to - before the description, characteristics or even price. Remember those appetizing hamburgers on fast food commercials? Consequently, customers desire to see what they are going to buy, and low-quality photos won’t satisfy them. You have no choice but to use only accurate, high definition and catching images that can give the consumers a full idea about the item they are interested in. But the biggest nightmare for the customer would be a delivered product that hardly looks like the one on the photo. Remember - in a best case scenario, such customer won’t buy a thing from you ever again and just forget about the existence of your store. As web traffic is rapidly moving to mobile platforms, many customers have started shopping online via phones or tablets. Naturally, they want it to be convenient, but non-optimized e-store can’t look equally good on a laptop and smartphone. More than half of shoppers get frustrated when they’re experiencing discomfort during the site browse on mobile devices. Thus, you need to have either a responsive website or a separate mobile site version. It’s not just a whim but a new standard for a successful e-Commerce business. If you can’t provide your customers with an intuitive interface comfortably to navigate on tiny mobile screens, you’re simply uncompetitive. Except that, Google started penalizing in search ranking websites with no mobile optimization. 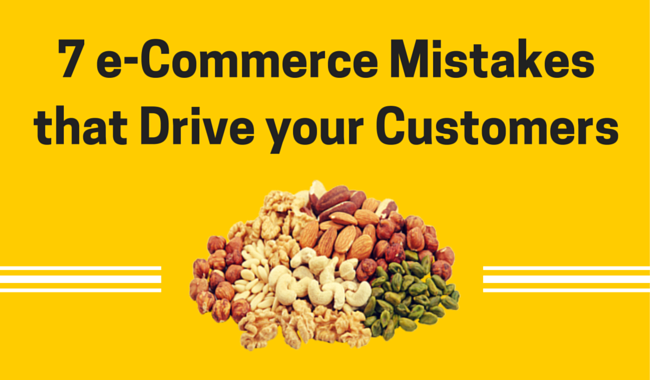 So if you want make consumers buy from you, avoid this dramatic e-Commerce mistake. Forcing your first time visitor to register is not a good practice to implement. Customers don’t like spending their precious time on filling in bureaucratic fields for no apparent reason - they’re already spending their money, what do you want more? Give your visitors the chance to register later and perform their purchases as guests. A little sidebar registration reminded (with a symbolic discount for the best result) would be enough for them to consider it as an option. Search Capability - Hide and Seek? The absence of search capability on your website is such an obvious mistake, that we won’t even discuss it. Who would ever want to try out a proverb “To look for a needle in a haystack” in real life? Mostly, e-stores do have search capability, but too often it appears to be rather poor. If a built-in system doesn’t cope with its tasks, look into more advanced ones such as solr or sphinx. However, when it happens that the requested product is not available, suggest an alternative. “White Dress in Black Stripes” instead of “White Dress in Blue Stripes” is always better than a mere blank page. Have mercy on your customers - get rid of popups. Website visitors hate those annoying messages that distract them from their peaceful and quite browse. If you still being devoted to the “hit of 90’s”, make them appear just once during the visit session, for example, on the exit intent. Sticky bars (something like the one you see above) or sidebars can become much more unobtrusive ways to deliver the message, ask for a subscription or offer a discount. Your customers will be thankful for the respect. You know you’ve done something wrong when is it’s harder to pay for an item than to find it. Poor checkout design is another critical and quite typical mistake that leads to cart abandonment and, as a result, conversion rate decline. Does it worth to be ignored? Multiple checkout pages give people more reasons not to finish transaction - make it one page. People don’t like filling a lot of unnecessary fields - reduce their number to minimum. Shoppers tend to forget applying their coupon codes on checkout - clearly display an appropriate field. Customers are trying to give you their money - simply take them. These are just 7 common mistakes out of a great number online shoppers suffer from. Besides them, we can mention such typical flaws as limited payment methods, overpriced shipping rates or dilatory support. And when the competitiveness for each customer purchase is so intense, every single detail matters. So, do what you can to offer the customers the best shopping experience out there and they will respond you with grace and crispy dollars.